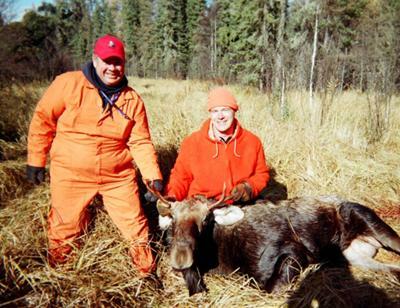 That's me sitting, the guy standing and the picture taker helped me haul out the moose. I started the morning off walking and calling occasionally, off the beaten trail and did this for three hours in the rain. I then popped out on another trail and look up and I could see a moose behind some willows. I really had to bring up the binoculars and scope to see if there were horns on this one! I figure he was a 1.5 or 2.5 yr old, and that he was 75 yards away. My first shot got him quartering to me and got one of the lungs...then my second shot him got him right in the heart. The funny thing was is the spot is only 40 yards from a place I way-pointed with my GPS last year! Last season when I was here there was a bunch of beat down grass...not down to the dirt, but enough for me to take notice. Something I had to way-point as I figured it was a good moose spot with all the activity. On the subject of getting moose out of the bush, one of the guys I go moose hunting with made his own ATV trailer and sled specifically for moose but they are a bit on the heavy side. I guess they do the job; I'll have to take pictures of them when I get a chance. I'm likely at some point going to purchase one... There sure are a lot of ideas out there. I think one of the biggest challenges is getting the moose onto the trailer? Also I have read about the gutless method of field dressing at this sure intrigues me, but I'm not sure how my back would take it...I'm sure it would take a while to do. Mark, thanks for your moose hunting story. It is always nice to hear about another hunters success. Because I live in BC I don't always here about hunter success stories from other parts of Canada. Your Saskatchewan Moose Hunt obviously was a success. I understand it was not as big as your last one... I think anyone who is a meat hunter will experience that from time to time. Getting the game out of the bush is always a challenge. Watch our site for future pages regarding moose transportation methods... We will be building a moose sled this winter as well possibly a tandem axle walking beam trailer. As for the gutless method of field dressing moose you should check out our latest page regarding the subject.